Grace B. Hadley (G.H.) 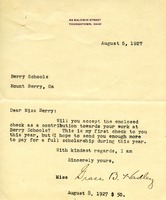 sends Martha Berry an enclosed check in the amount of $50.00. G.H. notes that the check is meant to fund a scholarship which G.H. plans to have fully funded by the end of the year. 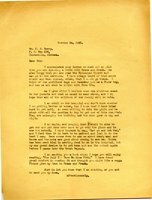 The letter is sent from 56 Baldwin St., Youngstown, Ohio. Frank writes a letter with news of his wife Grace and an update on his father's health. He inquires after Miss Berry's health and includes well-wishes.